I’m a bit of a late bloomer when it comes to Makeup and after years of sticking to one brand I realised I can use any brand I so choose. So when I went to Liberty London’s website and realised they were having an event that would be attended by Trish McEvoy, I decided to go along and see what the brand had to offer after I finished my Clubs and Spades Interview. I arrived early which is good for me, if you know me, maybe I am growing up. I had to wait until my allocated timeslot which was fine as I spoke to some of the staff and managed to find out a bit more about some of the attractions of Trish McEvoy like her beauty makeup planner. As I sat and waited by the counter I looked up and noticed the lady herself, Trish McEvoy, was standing in front of me, organising her makeup counter. I laughed and she apologised, I remember saying if it was my brand I would want it exactly how I would want it also, just like I am doing with myself and my son (Empire). This was the beginning of my experience and I must admit from here onwards, I was given nothing but the best service from staff that were all very clearly loyal and dedicated to the brand. Trish McEvoy herself walked me over to my makeup artist, Max, who usually worked in a different store but had come down to do the event. Max herself had worked as a makeup artist for the brand for 20 years and for a newbie like me, she was very good at explaining each step and making me practice myself. It was a session not only to teach an individual how to apply makeup but how important your skincare regime is as well. 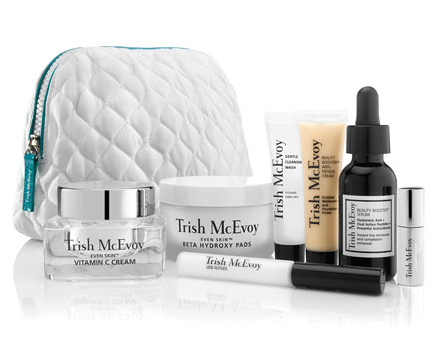 Trish McEvoy’s husband Doctor Ronald Sherman is a dermatologist and so she has amazing skin care products as well as makeup, I like the fact she works with her family. For the woman like me who is get up and go the beauty makeup planner that she has patented keeps everything you need organised in one case and comes in various sizes, it is definitely an investment worth having in my eyes. My lesson began after I was brought a nice glass of champagne and yes I was very coherent still as I wanted to learn. Trish McEvoy has 8 steps to follow for makeup application and Max walked me through each stage whilst teaching me how to apply them as well. I have listed the steps below as I think they are very useful and I wish I knew them earlier. My makeup chart I was given at the end contained the list of the 8 steps and which product was used for each. There was no way I could not repeat the steps when I got home unlike other brands where I cannot remember what makeup I am supposed to put on at what point. There was also no end to the testimonies from other women who were having there makeup done, including a woman who had one of Trish Mcvoy’s original makeup brushes, that was older than me. If that isn’t good quality then I honestly do not know what is, I myself need some new brushes soon so will be heading back to Max for guidance. I will not confess how much I spent on the products that I left the event with but I will definitely be doing some product reviews on the skincare products. As Max said looking after your skin is paramount and that is your base for everything, she also said prevention is better than cure when it comes to aging. As you can see from the picture I got with her and Trish they definitely practice what they preach. I must admit Trish McEvoy was very down to earth and after showing her pictures of Antoine she filled me with confidence in following my own dream of being an author. I can definitely appreciate a woman who tries her best to help other women and not only educate them but make their lives easier whether it is through make up, skincare or perfumes. So this is a massive thank you to Trish for her products and Max for spending the time to teach me how to use them.